Done from an Original, Drawn from the Life by Alexr. Campbell, of Williamsburgh in Virginia.--Ioh Martin Will excud Aug. Vind. / George Washington, Esqr. 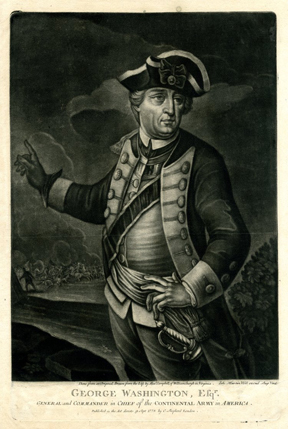 / General and Commander in Chief of the Continental Army in America. / Published as the Act directs. 9. Sept 1775 by C. Shepherd London. Version I: As shown. Collections: British Museum, Library of Congress. Note: The distinctions between Boglewood 2801 and Boglewood 2802, and the versions of each, have not been satisfactorily resolved and require further study.